Season of Ghosts is a groundbreaking music project, dedicated to the love for the unseen and film soundtracks. Conceived by Greek singer-songwriter Sophia Aslanidou, the project came to life in October of 2013 and the highly anticipated debut concept album, "The Human Paradox", is set to be released within 2014. 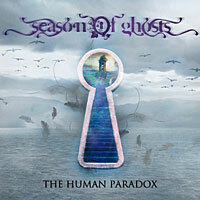 Season of Ghosts combine extreme rock and metal sounds, harsh electronics and powerful, compelling vocals, through the eerie spectrum of a Sci-Fi, horror movie. Sophia is in charge of composition, lyrics and co-production and handles both melodic and distorted vocals in a unique, storytelling atmosphere, that is bound to captivate audiences around the globe. Sophia, who was born in Caracas, Venezuela and grew up in Thessaloniki, Greece, put herself on the music map as the singer of BLOOD STAIN CHILD (Japan). In just a short time, she managed to become one of the most acknowledged female vocalists within the Japanese metal industry, known not only for her work with BLOOD STAIN CHILD, but also for a number of esteemed collaborations. In 2010, Sophia moved to Japan to start her music career, bringing her international perspective and know-how to BLOOD STAIN CHILD and together they recorded the band's 5th studio album, Epsilon, which still is their best seller to date. They toured extensively in Japan, America and Europe until Sophia's departure for professional and personal reasons. While still in BLOOD STAIN CHILD, Sophia was involved in the "Imaginary Flying Machines" project, with bands such as Disarmonia Mundi, Destrage, Rise To Fall, among others and sang in the now famous "Princess Ghibli" albums, featuring innovative, metal covers of Studio Ghibli anime soundtracks. She has also collaborated with popular Japanese artists, such as MEJIBRAY and AYABIE.